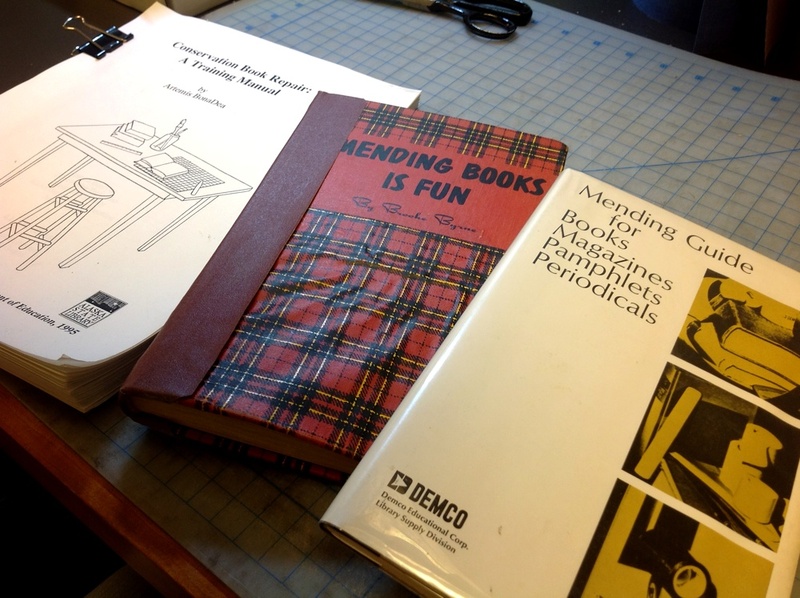 There are a couple of old book-repair manuals on my bench at Beatley Library that, up to this point, I have more or less ignored in favor of my own collection at home. One is in many ways an advertising piece from Demco, and the other is sort of a mix between a general non-fiction book and an actual repair guide. (We also have a third, Artemis BonaDea’s 1995 Conservation Book Repair: A Training Manual [PDF], which is, thankfully, genuinely useful.) Last week, I started looking at them a little more closely, and I think it might be interesting to talk about them here, to see how things have changed (or not) over the years. These are the guides present at my workbench at Beatley Library. Not the best selection, but luckily I have some excellent, more recent resources at home. 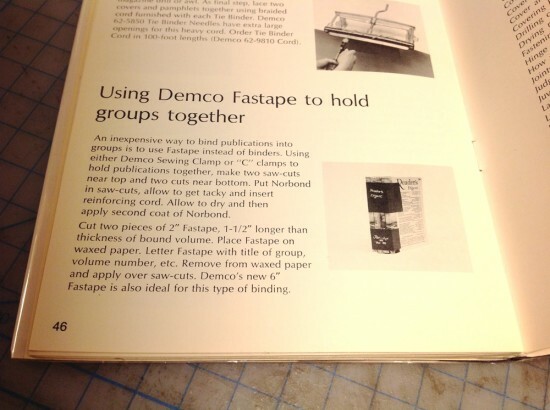 I’ll start with the Demco guide, Mending Guide for Books Magazines Pamphlets Periodicals, and perhaps move onto the others in future entries. As I noted, this manual is, at heart, an advertising piece, although there are relatively few “real” ads (see one below). The focus is on Demco products, for better or worse. This might not be as problematic if there was any indication of what actually made up these materials—but, as you would expect from a proprietary product, there’s not (at least, not here). Additionally, the choice of materials, and the techniques suggested for their use, are bound to create breaking points in paper that is already dealing with damage from patron use. An extra line of text here and there would have helped alleviate this problem somewhat; in this case, I’m not sure whether this is so much a sign of the times as a result of the nature of the manual itself (it is, after all, fairly basic). In short, there’s no real mention of sympathy to the item being repaired, something that preservation librarians and conservators really should be considering during repairs. I also wonder whether the manual really takes issues of longevity into account (case in point: tape!). 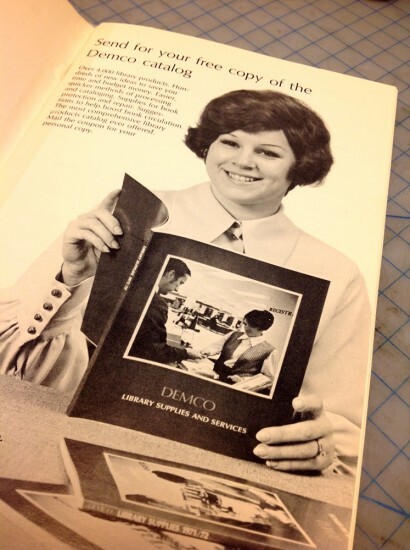 The sections on covering books with various coatings—Demco Book Lacquer, Demco Clear Plastic Spray, and Booklon—in order to protect them were particularly interesting. What are the long-term effects of these materials? Did they really help more than harm? Similarly, the manual suggests using Demco Book Cleaner (still available) on all books after repairs have been completed. Without knowing the chemical composition of this substance, it’s impossible to speculate on the damage it could cause (other than that related to its moisture), but I’m skeptical. Besides, we have other ways of doing surface cleaning that are dry and don’t, to my knowledge, leave behind any residue. While we’re on the topic of longevity, although its interesting, I somehow doubt that this technique would hole up to much patron use. All of that aside, there are some things to praise here, I think. 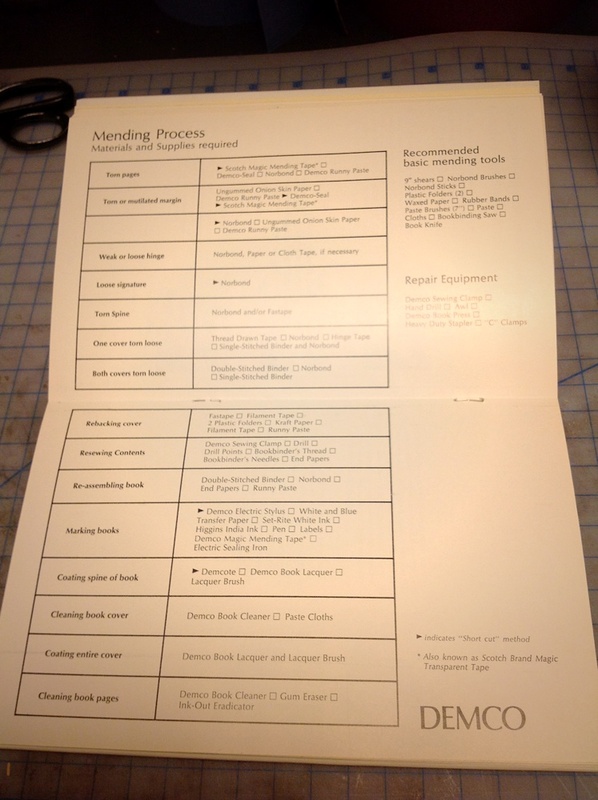 The manual includes a section on decision making, advice for working in batches, a mending chart (meant to be removed and displayed on a wall), advice on how to ease open a new or newly repaired book, and information on care and handling, including general care, specifics for reference books, and advice for shelving. Here’s the mending chart. While I may not agree with the specific products or choices, the idea of having such a chart, particularly to aid in supervision and education of student book-repair workers, seems sound. All in all, I think it’s fair to say that this manual is exactly what you’d expect—a bit dated, and fully an advertisement, but still a resource that would have been helpful to a large number of librarians who were, for some reason, forced into mending collections without any prior experience. Even if I don’t personally agree with many of the techniques and materials suggested, that doesn’t mean that in the right time and place this couldn’t have been valuable—and it is only the education I’ve been lucky enough to receive, both in and out of the classroom, that allows me to critique these contents at all. During my internship at Baker Library, Priscilla Anderson made a point of articulating that although it can sometimes be easy to be frustrated with the nature and/or quality of previous repairs (and I find myself in that situation a lot at Beatley), it’s important to recognize that librarians and conservators of the past were doing the best they could with the knowledge and materials available to them—and that we will one day be similarly judged by our successors. In addition to being sympathetic to the book, we should attempt to be sympathetic to its previous mender(s), as well. Oh my goodness! When I was little we had this jar of some kind of paste that I always thought smelled great. As an adult, I could never remember just what it was and I’ve tried to find it but had no luck. I thought I would never know, but it was the Runny Paste!! !